The UK’s center of excellence for oceanographic sciences, the National Oceanography Center (NOC), has selected high-performance hybrid navigation technology from Sonardyne International Ltd. for the next generation of its Autosub autonomous underwater vehicle (AUV), targeted for under-ice operations. The NOC, based in Southampton, will incorporate Sonardyne’s highest performing SPRINT-Nav inertial navigation system (INS) into the new 2,000 meter depth-rated Autosub, which is being specifically developed for carrying high-performance sensors on the most demanding research missions under polar ice, hence its name Autosub2KUI, or A2KUI. Sonardyne’s relationship with the NOC extends back over more than two decades, when it started supplying the NOC’s research ships with USBL acoustic tracking technology. 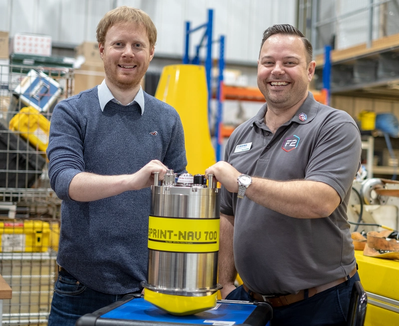 More recently, the NOC and Sonardyne have worked together on a number of Innovate UK funded projects, with the latest being the Precise Positioning for Persistent AUVs (P3AUV) project, which is trialing new advanced navigation techniques on NOC’s ‘Boaty McBoatface’ Autosub Long Range (ALR) and new ALR1500 vehicles. Sonardyne is a partner at the NOC's Marine Robotics Innovation Centre.